Arborjet, a plant health care company based in Woburn, Mass., released Mn-jet Fe, its new liquid micronutrient solution for trees, palms, shrubs and groundcovers. Mn-jet Fe alleviates interveinal chlorosis caused by micronutrient deficiencies and increases chlorophyll production for up to three growing seasons, improving tree vitality and aesthetic quality, Arborjet said. “Iron and manganese deficiencies are often overlooked yet can cause major damage to trees,” said Russ Davis, president and CEO of Arborjet. 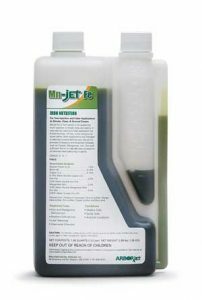 Mn-jet Fe, used as formulated or diluted with water, can be administered up to one time in the summer or up to three times in the fall. Its liquid formulation mixes easily into solution and can be applied through micro- and macroinfusion equipment or as a foliar spray for shrubs and ground covers. It is available in one-liter containers and in case quantities, and one liter of Mn-jet Fe treats at least 20 trees. Arborjet will offer a free educational Mn-jet Fe webinar on Oct. 3 at 3:30 p.m. CDT.